Meanwhile, back in the old country, Mt. Redoubt is erupting again. Redoubt is one of four volcanoes on the west side of Cook Inlet opposite of the area where most of the population of Alaska lives. The four are Mounts Spurr, Redoubt, Iliamna, and St. Augustine. Most of time, these volcanoes are happy to rumble and let off little plumes of highly scenic steam. But once a decade or so, one of them has a serious eruption. The four volcanoes are part of the Alaska range that continues southwest and west to become the Aleutian Islands. The whole arc is a subduction zone where the North American Plate rides over the Pacific Plate. As the oceanic crust sinks into the mantle and melts, blobs of it rise up under the continental plate and cause volcanoes. The water that seeped into the oceanic cruse over the millions of years that it spent being the floor of the Pacific Ocean stays with the magma and gives it its explosive power when it gets close enough to the surface. This is the same process that created the Cascade Range in Washington and Oregon and powers its ten or so active or potentially active volcanoes. In Alaska there are about fifty volcanoes that have erupted in historical times (about two hundred fifty years). That's more than twice as many volcanoes as are in the other forty nine states combined. Volcanic eruptions are a fact of life in southern Alaska. Right now, the ash plume is blowing up the west side of Cook Inlet. Most of the population lives on the east side, though our family cabin is already in the ash fall. 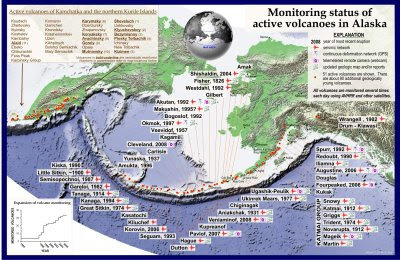 The biggest hazards from eruptions of the four Cook Inlet volcanoes comes not from the explosions or associated lahars (mud flows cause by the sudden melting of the glaciers on the mountain), but from the ash plume. Volcanic ash is made up of fine particles of highly abrasive rock and glass. It's dangerous for people with respiratory conditions, bad for most machinery, and disastrous for turbines, such as jet engines. Unfortunately, Alaska's road network covers less than a third of the mainland. Everything else depends on aircraft and, during an eruption, the airports in the path of the plume ground most flights. Number Three Sister is involved in the aircraft business in Anchorage and I need to call my sisters tonight (Mom's estate business). I'll pass on any news, gossip, or insights that she has that hasn't been in the regular news media.